This is a remarkably short book, but it is quite quite lovely. I defy anyone not to get a lump in their throat when they read it for the first time. This was filmed twice to my knowledge. The first was in 1951, as Never Take No for an Answer; the second was a Hallmark production in the early seventies. The story first appeared in Good Housekeeping under the title Never Take No for an Answer. Listen for Pleasure produced an audio book of this in 1979, along with The Snow Goose and Ludmila. It was read by Sir John Mills, and can still be found occasionally on eBay. Published by DOUBLEDAY AND COMPANY, INC. This book is available in Britain as a Penguin paperback, paired with The Snow Goose. If you have not read either, then buy this book - you have a treat in store. Second-hand copies of the hardback are not hard to find - firsts are not uncommon, either. 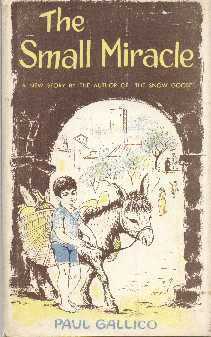 In 1953, a new edition was published in the UK, illustrated in colour by David Knight. This is rather difficult to find, but quite attractive if you do find it. 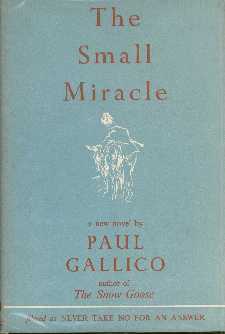 In 1973, a Hallmark book was published, called Paul Gallico's The Small Miracle. Be warned that this is merely an adaptation of the story by Edward Cunningham, based on the Hallmark TV film, and is truly naff. It's got some nice photos from the film, though. The Small Miracle can also be found in a book of short stories called Angels and Awakenings, edited by M. Cameron Grey and published by Doubleday in the US in 1980. The stories in here are all about miracles and angels; it's actually considerably better than it sounds, and has some very fine stories by some very fine writers. These pages are copyright © Martin Benson 1999-2008. You are welcome to link to them.